Have any one tried using this gift card to buy Cricket Wireless Service Payment Card when it is on promotion? I recently join cricket wireless and found that target occasionally offer 10% or $5 off $50(which is a 10% off) . so to ‘create’ a 20% off total. The online listing says that you can’t use a Target gift card to purchase a Cricket Wireless card. However, you could try to combine it with some other purchases in-store and see if it goes through. I think you can still use REDcard though for 5% back. 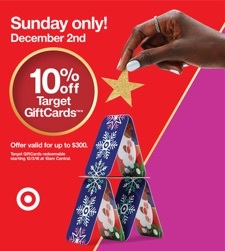 Is there a list somewhere of which gift cards (other than a regular Target gift card) are available with this offer? Nevermind, I didn’t read far enough. Looks like it’s only good for Target store gift cards.